Blog / Florence / Hands Off, Literally! 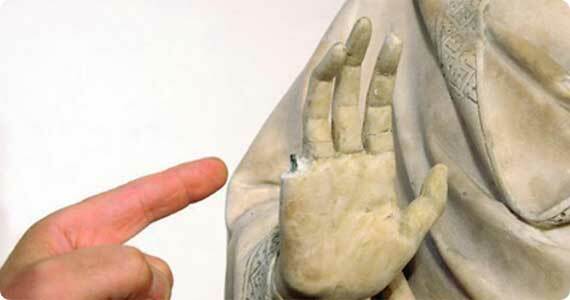 Yesterday afternoon, an American tourist visiting the Opera del Duomo museum in Florence damaged, apparently by accident, the right hand of the statue of the Virgin in the Annunciation group made by Giovanni D’Ambrogio. Personnel from the museum intervened immediately and the tourist excused himself for the damage – the little finger cracked but did not fall, rescued by personnel before it did. Unfortunately, excuses are not enough to avoid official charges for the damage. The museum director, Timothy Verdon, says that unfortunately the fingers from this sculpture from the 14th century are its weakest point since it was made and that the damage is actually to fingers already recreated in gesso to replace other broken pieces. The damage is due to the tourist’s actions, since it had just been checked upon its return to the museum after a time in the temporary exhibition at the Uffizi. Hall personnel say the tourist seemed to be “high-fiving” the statue. The museum director reminds everyone to remember that “one of the basic rules when visiting museums is to not touch the works of art”, specifically in museums that do not put barriers around the works and which allow visitors to study them up close.